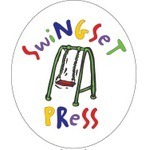 About Swingset Press from their Facebook page: Swingset Press has been blazing the tween product pack since 1994 when co-founder Ron Solomon left NBC where he’d written and co-created smash-hit tween sensations like, “Saved By The Bell,” and “California Dreams.” Since its start, Swingset Press, through Solomon and his wife, Iris, has created more than just products. 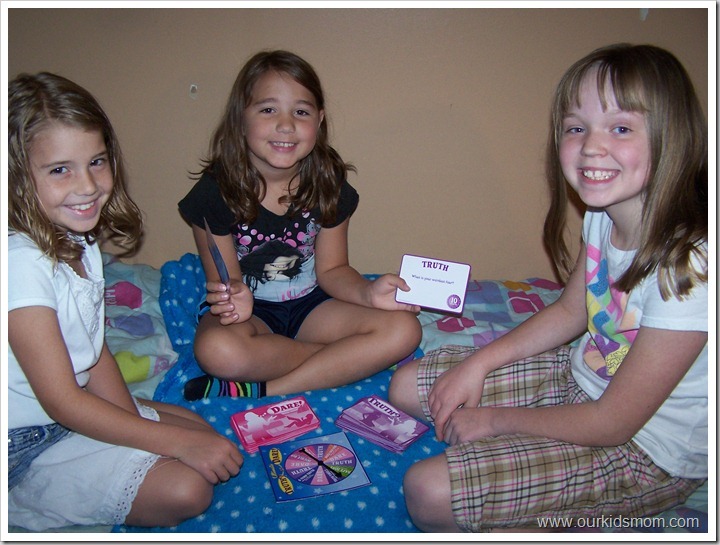 The Colorado-based company has created categories, from photo phonebooks (“My People: Stuff Directory”) to black light diaries (“My Ultra Secret Stuff Journal,”) and most recently, its highly popular and fun line of pajama party games for tween BFFs. My older daughter, Michaela is almost 10 & is the typical pre-teen. She loves pajama parties & playing games until all hours of the night. 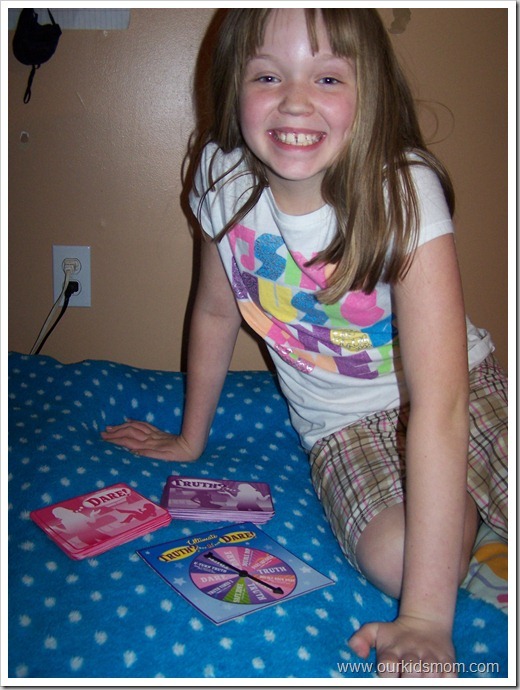 When I told her she would get to review Ultimate Truth or Dare, Star Awardz, & Acting Out games, she was super excited! She wanted to play them right away, but didn’t have any friends over. So, she had to settle for her brother. Let’s just say, the game didn’t last very long! Ha-ha! He was not impressed with these “girly” games. 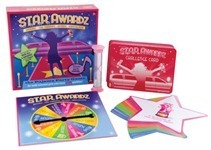 The second game, Star Awardz, is more of a performance based game. Players take turns performing various challenges from four categories. 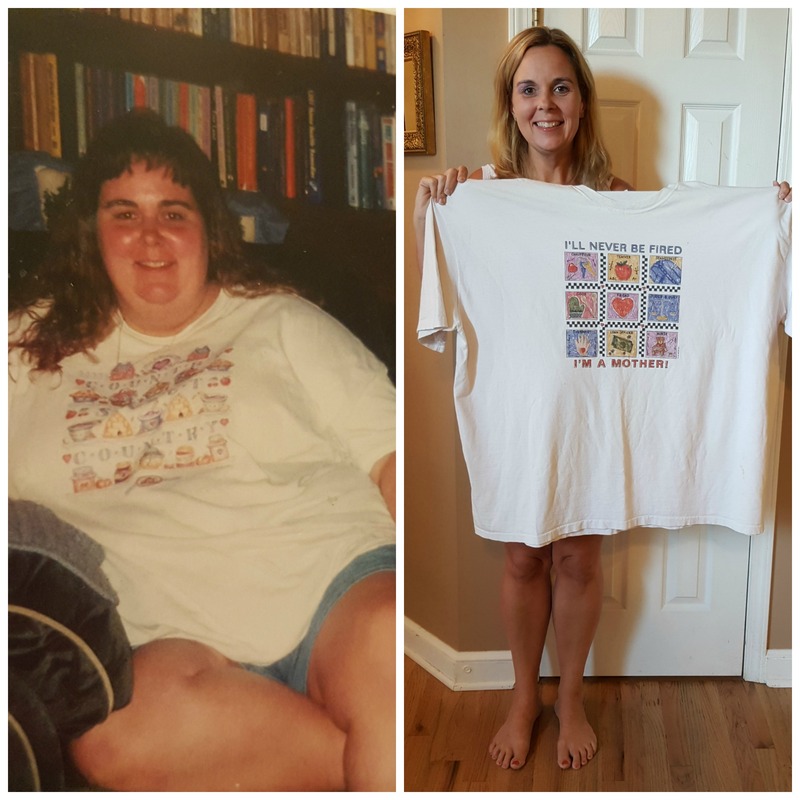 They do things like singing a song like an opera singer, acting like they’re jumping out of an airplane, dancing around like a hillbilly at a square dance, or snorting like a pig. The first player to receive all four “Star Awardz” wins. The third game, Acting Out is a crazy fun game where players perform two cards at exactly the same time and have the other players guess what they’re doing before the time runs out. There are silly things like: “Pretend you’re a runway model while you talk like the bratty kid you babysit” OR “Have a pillow fight while you hum the theme song to your fave TV show.” Every game is different because each time you pair up two different cards. There are 100 cards to mix up & have a super silly time. Depending on personalities, all three games are great for teens and pre-teens to play. They all require just 2 or more players & are for ages 7 and up. 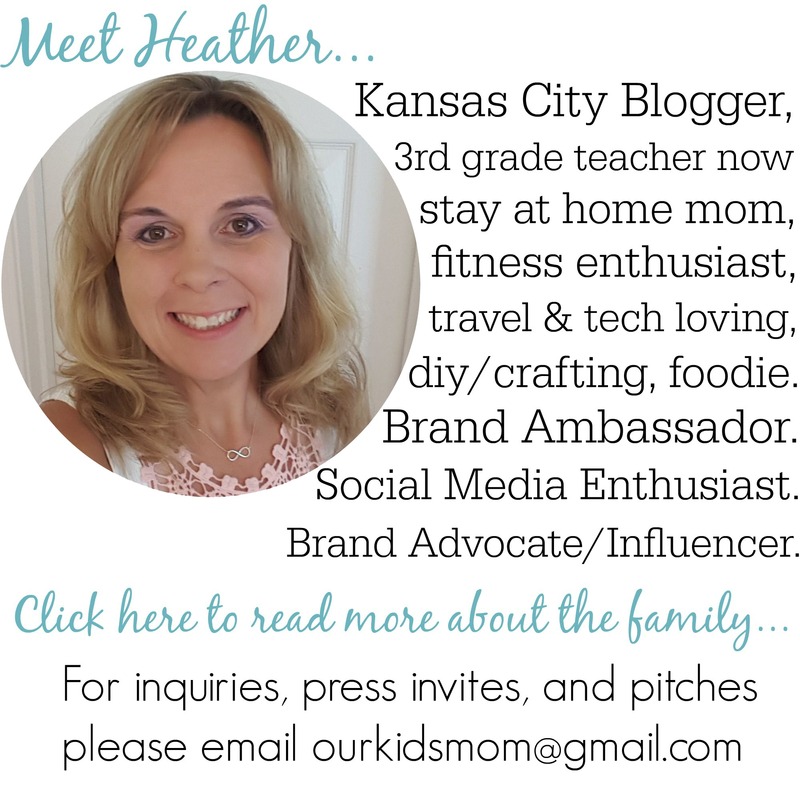 ONE OurKidsMom reader is going to win their choice of PAJAMA PARTY GAME! This giveaway ends at 11:59 PM EST on July 13, 2012. I like that the game isn’t too risky for a tween. I like the Mash Frenz packs- I remember that game from jr high! I like the magic slates because my daughter loves to draw and no paper waste around if I would get this. The Sock Monkey Babies are cute!! I learned that they sell sock monkeys! I like the Mash Party Pj Party Game. Thanks. Camp Cards Frendz Pakz look like a must have for summer campers. I know my daughter always loved things along these lines when she went each summer. I love and would choose the Acting Out PJ Party Game! I want the archery set. 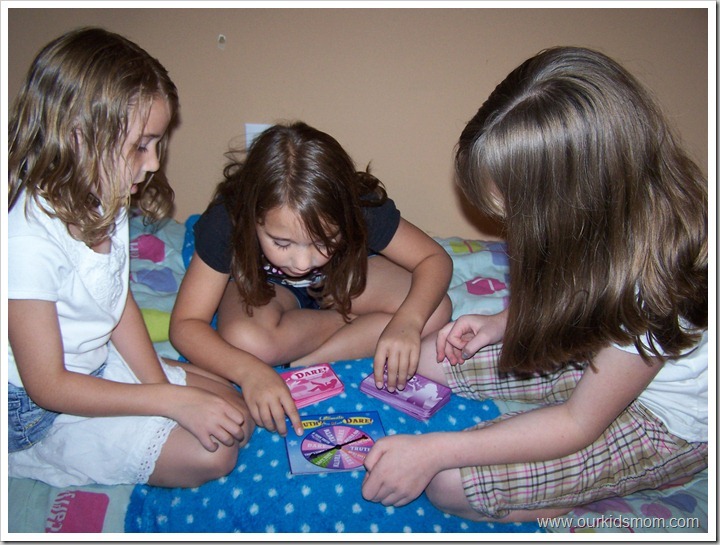 Dance Maker Pj Party Game. 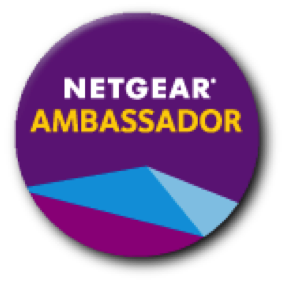 I learned that the company is located in Rowley, Massachusetts.